You may recall that when Isildur1 burst onto the high-stakes online poker scene in late 2009, one of his early victims was the then virtually unknown –and like Isildur1 anonymous– jungleman12. Isildur1 promptly relieved jungleman12 of a sizable amount of his bankroll during their high-stakes heads-up confrontations. Fast-forward to late 2010, and not only do we have identities for their online screen-names –with jungleman12 positively identified as Maryland College student Daniel Cates, and Isildur1 all but confirmed to be Swedish poker pro Viktor Blom—but both players have regrouped from their 2009 struggles –jungleman12 at the hands of Isildur1, and Isildur1 at the hands players like Phil Ivey, Patrik Antonius and Brian Hastings. So with both players back in action we had the inevitable rematch which took place on Sunday night, with the two players squaring off over a couple thousand hands of $100/$200 No Limit Holdem. 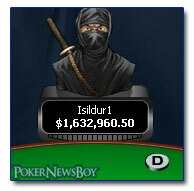 This time around it was jungleman12 getting the better of Isildur1 to the tune of almost $100,000. The match only took place because Cates was waiting on Tom Dwan, so the two players could continue their challenge match, which was then put on hold for a few hours while Cates and Isildur1 battled it out! This entry was posted on Tuesday, October 5th, 2010 at 4:56 am and is filed under Poker News. You can follow any responses to this entry through the RSS 2.0 feed. You can leave a response, or trackback from your own site.